Let's be honest, the chance of a zombie apocalypse is rather low. Other disasters are much more likely, as we have sadly seen with earthquakes in Japan. 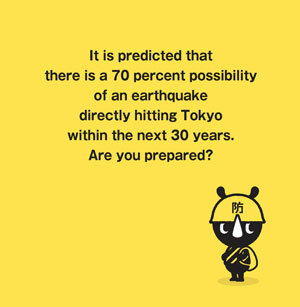 In fact earthquakes are a big risk in Japan and the authorities are keen to get people prepared. So the prefecture of Tokyo has a number of handy publications available but naturally the Japanese do things a little differently. 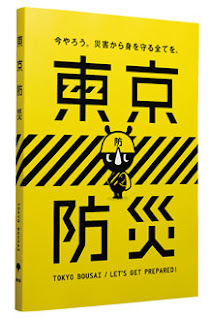 They have a cute cartoon character to brand the material and there is even a manga to reinforce what may happen in an earthquake. The Lets Get Prepared and Survival Tips publications are particularly interesting. For example, local parks have been designed as evacuation areas. Bench seats can be converted into cooking stoves, park lights are solar powdered and there are manual water pumps. And rows of manhole covers that can be turned into toilets. There are also handy details on making your furniture secure so it doesn't squash your cat in an earthquake. The Survival Tips also had some tips I had not seen before, like how to convert an AA battery into a C or D size battery. Very useful if the batteries in your old school ghetto blaster go flat. Another one was how to make a backpack out of a pair of trousers. Yes they are in English and the cartoon style, while simple, gives you a clear idea of what to do. The Manga was awesome but finished just when it was getting good.